Why should we choose shower panel? The angled modern look of stainless steel shower panel makes a stylish addition to your contemporary bathroom. Features fully adjustable body spray massage jets, a rain shower, and a hand shower. Stainless shower panel is constructed from 304 stainless steel. The panel is durable, and corrosion resistant.GenerallyÂ ,It can be used for more than 20 years . Shower panel is designed to be easy to install and maintain. 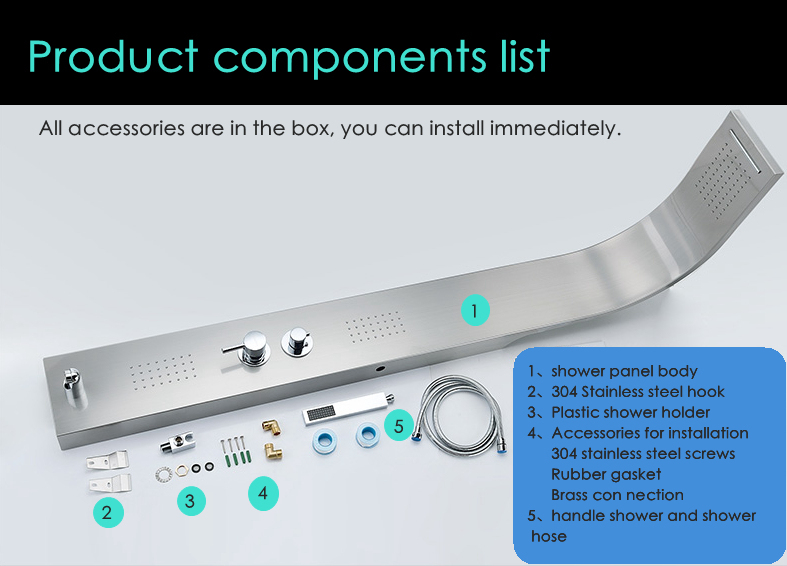 You can use Household tools to install and replace broken accessories quickly.Â From this point, the long-term cost of shower panel is very low. 1.Good quality: as a result of specialization and standardization! In production, high-power laser cutting machine and automatic lines have been applied. 3.OEM\ODM:Â Of course, we are professional manufacturer, OEM and ODM are both welcome.Â We can produce according to customer-supplied CAD drawing or picture. 4.Free sample: we can provide you free sample, but at first you need pay for the sample shipping fee. 5.Good attitude: Whatever happen, no excuse. Honest communication and be responsible.